There is hardly anybody, who is not fond of music. Not everybody is a diehard music fan, but everybody listens to music for some stress relief, or during the leisure time. It is always convenient to listen to music from streaming services these days, rather than downloading music and listening to them. There is always a huge collection of music available in the streaming services. It can serve the appetite of all music lovers. You can change your flavor anytime, without the need of spending hours downloading music of your favorite genre. There isn’t any doubt, Spotify is the most popular music streaming service. But how to use or play music from Spotify in India? I know the pain of the Indians. Spotify is not available in India. There isn’t any surety about whether it will be available in the future. Being a music lover, I am sure, you have searched for, how to play Spotify in India. Though there are numerous quality music streaming services available in India, none can actually beat Spotify in all the spheres of music. So today, I will be discussing how to enjoy Spotify music, as long as you have access to your computer or your laptop. Sorry, this tutorial is not about how to download Spotify from the Play Store, tricking Google, you are from a different country. So without further delay, let’s get started. How to use Spotify in India with VPN-Free? Open Chrome browser and add the free VPN called Hola VPN extension from the Chrome Web Store. 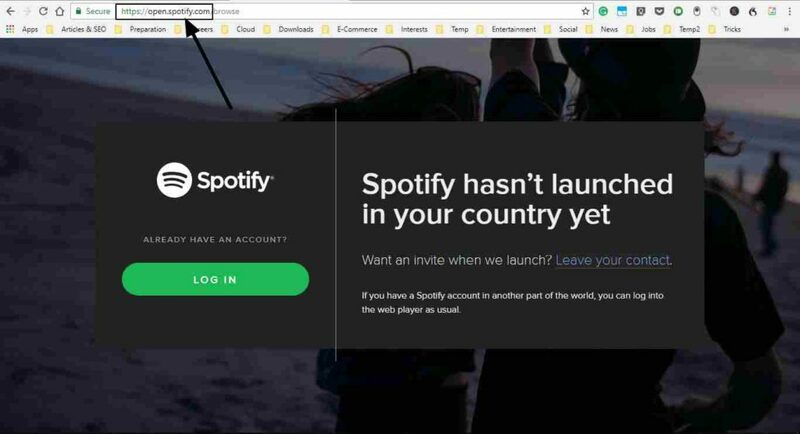 After installing the Hola VPN extension open the Spotify website and click on the Hola extension icon given on the browser bookmark bar and select the USA country to trick the Spotify in order to use in India. Just visit ‘play.spotify.com’ on your web browser. You can use any browser. Chrome, Firefox, Microsoft Edge, or any other popular browser will do. Click on the ‘Log in’ option. You will get numerous ways to sign up. I will recommend you to login in with Facebook, rather than going through the long process of sign up, with your email ID. 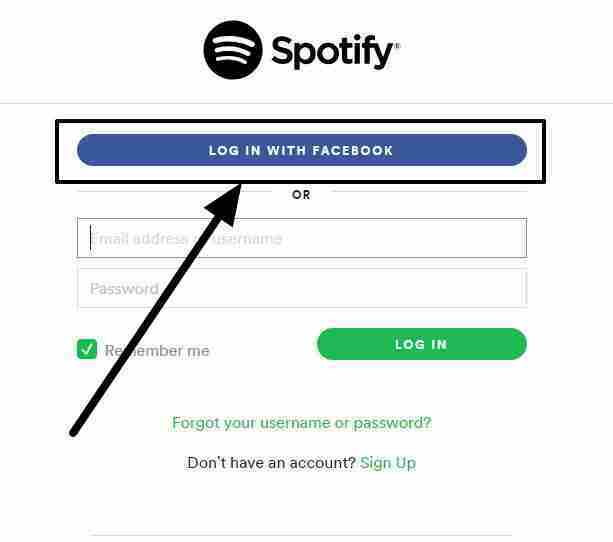 A new window will open, where you will have to give to Spotify to access your Facebook account data. Just allow it to get started. Once you are done, the glorious Spotify homepage will be in front of you. Ah! Refreshing! 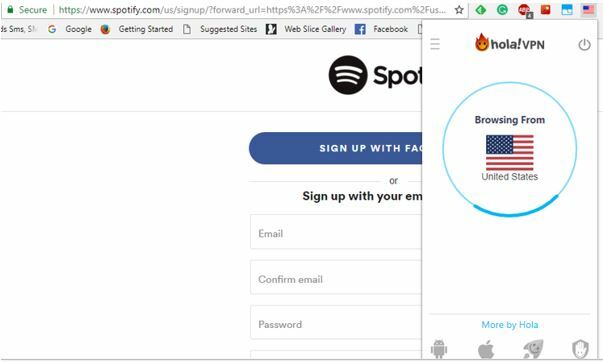 If you want to use the Spotify in India on Android using VPN or in other countries outside the US then you just simply follow below-given steps. Search for Turbo VPN or use this link. After installing the Turbo VPN; open the app and connect it with any free like Singapore or USA. Once you successfully connected with VPN server, open the Spotify app or website on the browser and you will successfully able to access the Spotify music this time on your Android Phone. I don’t think I will have to elaborate how to search for songs and play them. You might be an expert in all those stuff. With the Spotify web player, you can play music at 128 kbps. Being a premium subscriber, you can get a better quality. The bitrate will be 256 kbps. But with the desktop player (which you can’t use in India), the music quality will be clipped to 160 kbps for the free users, and 320 kbps for the premium users. The music quality might be clipped down, but it is enough to give you some refreshment and fulfill your music appetite, whenever you need it. Being an Indian user, I will not recommend you to pay for the Spotify services right now. Yes, hold on for a few days. As after all the service is not officially available in India. But if you are using Linux, you can use Spotify desktop player, even if you are in India. How? I will be covering that in a new tutorial, in the coming days. Don’t worry about it. Hope the tutorial was precious to you. I am sure, it was if you are a music lover. What are your views about playing music from Spotify in India? Let me know about it, in the comment section down below.